One of my all time favorite books is South: The Last Antarctic Expedition of Shackleton and the Endurance (The Explorers Club Classic) . It's an amazing adventure and an incredible story. It's a comfort to know that any challenges I face will be easier than those conquered by Shackleton. Luckily, traveling to Antarctica these days is far less hazardous. And we're glad of that because we'd really to send one of our favorite bloggers there as our surrogate eyes and ears. We're also glad because the we won't have to worry about her getting eaten by polar bears. Help send Grrl to the far south, go vote! 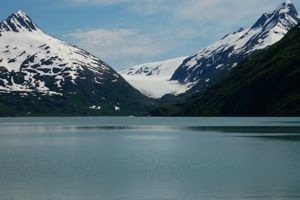 Portage Glacier, AK. This is not Antarctica, but there is snow.